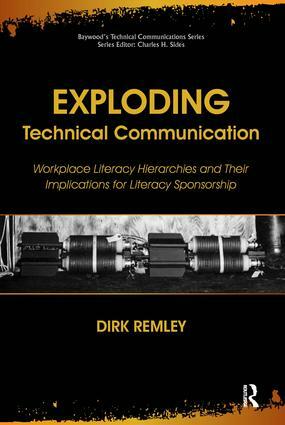 Within the framework of New Literacy Studies, Dirk Remley presents a historical study of how technical communication practices at a World War II arsenal sponsored literacy within the community in which it operated from 1940 to 1960 and contemporary implications of similar forms of sponsorship. The Training within Industry (TWI) methods developed by the U.S. government and industry at that time included multimodal literate practices, particularly combinations of visual, oral, experiential, and print-linguistic text. Analyses reveal a hierarchy in which print-linguistic literacies were generally esteemed at the workplace and in the community. This literacy hierarchy contributed to a catastrophic accident that killed 11 people, prompting changes in the approach to designing certain training documents. This book links technical communication, especially the multimodal forms of representation commonly found in technical communication and instructional materials, to the concept of literacy sponsorship. The TWI methods used in training and system improvement during World War II are currently applied in business and industry as part of the "lean operating" and "continuous improvement" philosophies. These methods have also become part of the experiential learning philosophy favored in academia. Remley includes examples of current applications of multimodal forms of technical communication similar to those used at the arsenal as well as new media-related applications related to training and instruction. He also discusses their implications for literacy sponsorship. This book provides useful information for technical communication and literacy scholars and educators as well as practical case studies for business leaders, consultants, and practitioners. Intended Audience: Scholars in technical communication and literacy/writing studies; scholars in business (especially management and organizational analysis) and business communication consultants; scholars in history and sociology.